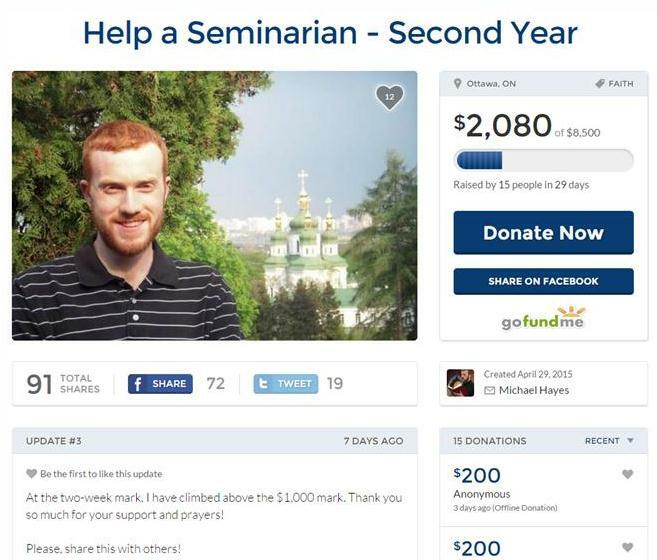 Vox Cantoris: Help a Seminarian! I would like to put out this appeal for Mr. Michael Hayes. I know Michael and can vouch for him. He is studying for the Catholic priesthood for the Ukrainian Rite of the Catholic Church in Canada. Michael writes below his appeal. Can Vox readers put him over the top? Enjoy this blog. I won't contriubte through gofundme - they shut down a fundraising campaign by Christian Bakers in the US, rcently. I will, however, send a cheque to Michal if you will have him contact me with his address. I agree with you about GoFundMe. I was disgusted with what they did. He took this out before that unfortunate occurrence. Write me at voxcantoris@rogers.com and I will forward it on to him.